Photo Match Photo match provides a way to set up a camera view so that the modeling environment matches up with a photograph. Its can be used to match an existing model with a background photo or one can start from scratch with a photo and then trace over a it in 3D!Styles A style is simply a saved collection of SketchUp display settings. No more fussing with many settings every time you want to change or customize your model's appearance. No longer is it necessary to use scenes (formerly known as pages) to save your display settings. With a single click, you can quickly apply a style to any model by selecting it from the new Styles browser.You can personalize your own styles and save them as part of a library, and you can easily share your style files with others.Watermarks Watermarks are images placed in the background or foreground of the drawing area and span the entire area just as sky and ground. Watermarks are great for creating backgrounds, such as simulating paper textures beneath a model. Watermarks can also be used to place logos and other graphics directly on the screen. Watermarks are part of Sketchup's new styles system for easy management.Sketchy Edges Sketchy Edges is a new way to render edges to look as if they were drawn by hand. Sketchy Edges are part of SketchUp's new styles system.Fog Add atmospheric haze to a model with the new fog display. 3D Text ToolNow its easy to create signs and letters directly in SketchUp using the new 3D text Tool. Choose from simple outlines, filled surfaces and fully extruded 3d text using most fonts on your computer. [PRO] LayOut SketchUp 6 features a set of LayOut tools for 3D designers who need a page layout program to communicate complex concepts. The new feature will provide simple tools to place, arrange, title and annotate SketchUp models, photographs and other drawing elements to assemble presentation and documentation graphics for both print and screen.Text and Dimension Improvements We've made the text and dimension tools more versatile by supporting font sizes that remain fixed relative to a model. We've also improved the quality on screen, in images and in printing.Speed SketchUp is now faster, up to 5x faster depending on models and hardware.Force Inference Directions Now its easy to tell SketchUp exactly which direction you want using the arrow keys. Left = red, Up & down = Blue and, Right = Green. We've also added toggle functionality so you don't have to hold the keys down.Component, Materials, and Styles Browsers The components and materials browsers have been streamlined to improve ease-of-use.Intersect Tool We've made the intersect feature more robust. We've also added two new ways to intersect: Intersect Selected and intersect context.Paste in Place Paste in place is an improvement to copy, cut, and paste functions. The precise location is remembered for quick placement of pasted selections. These enhancements are great for moving geometry in and out of components or groups without having to reposition your selection.Two-Point Perspective Two point perspective views are now possible in SketchUp. Easily recreate this classic style used by draftsmen and illustrators to create 3D renderings of buildings.Better Modifier Keys Use modifier keys to invoke operations like copy at any time during an operation.Native Support for 3D Warehouse and Google Earth Interaction with the 3D Warehouse and Google Earth is built into Google SketchUp Pro 6 and no longer requires a plugin. Oftmals möchte man einfach nur wissen wie weit 2 Orte voneinander Luftlinie entfernt sind. 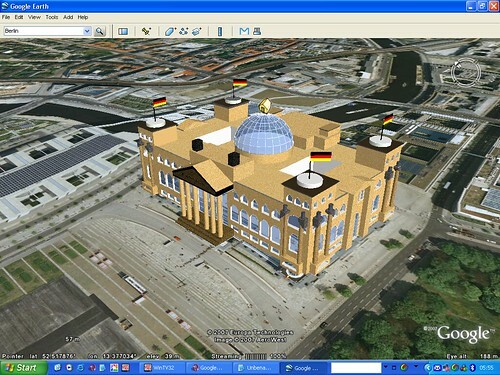 Was einfach klingt ist meistens garnicht so einfach herauszufinden, Google Earth hat sein Lineal - aber Google Maps hat außer der kleinen Maßstabsanzeige am linken Bildschirmrand ansonsten keine solche Funktion. 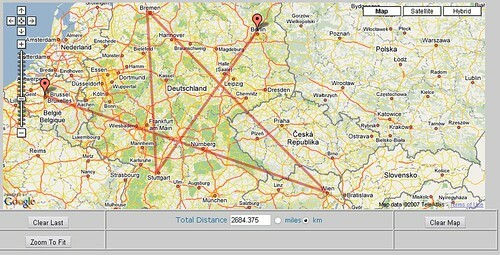 Hier schafft der Maps Distance Calculator abhilfe. Googles Personal Homepage ist zwar ganz nett und praktisch, aber leider haben die Designer hier anscheinend nur wenig Mitspracherecht gehabt. Die einzelnen Module sind hässlich eckig und seit der Einführung der Tabs sind auch die Farben leicht Augenkrebserregend. Ein Script für Firefox und Opera rundet die Ecken ab und färbt den Hintergrund Google-blau.